Trying to help the players a bit, so playing around with some ID cards I can print out for them to have. Publishing here to get their feedback. Somewhere (probably the forms book) there are sample ID cards for a variety of services. I've got 8 of them printed out but heck if I can find them in the literally 1000's of Traveller documents I have. They are a research station card, Scout ID, Naasirka, Tukera Lines, Marine, Navy, Makhidkarun and the 4518th Lift Infantry Regiment ID cards. So I will need to up my game a bit to make these a bit fancier. I do stick their primary "certifications" on the front - I will probably do the reverse to hold all their skills. 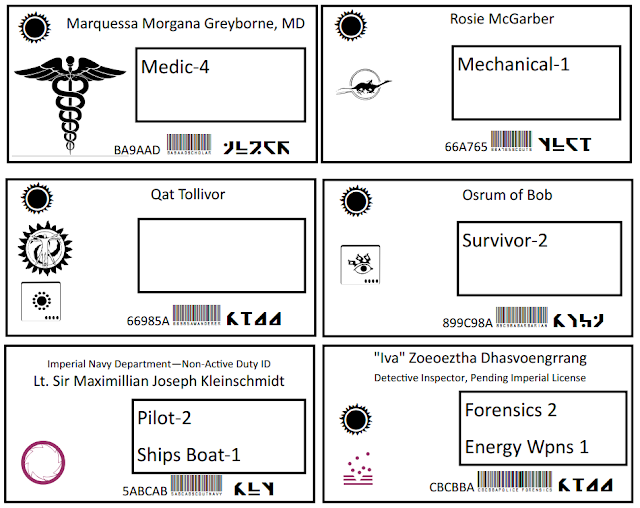 I also am planning on printing out cards for the weapons they have: we're doing Classic and some kind soul managed to create all the weapon cards (one of the 1000's of Traveller files I have...) Just need to pull out at least one of each. And I have a printer and card stock. And apparently I need to ge tin touch with Qat to see what her primary skills are!